The first thing he did was plug in our American toaster oven. With the US to EU plug adapter in place, he put in a slice of bread, turned on the toaster oven and waited for warm, crispy goodness. 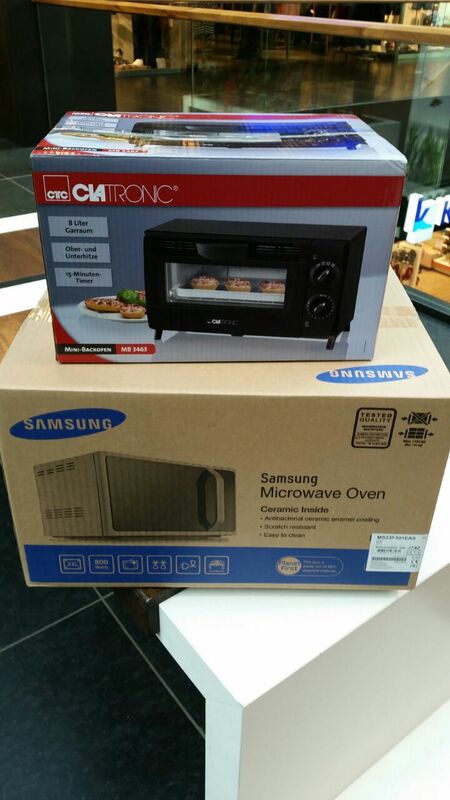 The unit appeared to be working fine, so Craig went about unpacking some other boxes as his toast was being made (a watched slice never browns, you know). What my starved electrical engineering-minor husband failed to remember is that American appliances are built for 110 V and 60 Hz electricity, and European outlets supply 220 V at 50 Hz. While he had the plug adapter in place, he forgot to use a transformer to convert the voltage, hence the fire. Dissatisfied with his burnt toast, he decided to cook an omelet on the stove. He grabbed a pan, sprayed it with oil, turned on the burner, and waited for the pan to reach the ideal temperature. Minutes went by, but the oil never sizzled. He put his hand near the center of the pan but didn’t feel any heat. He put his hand on the pan but didn’t feel any heat. He put his hand on the burner but didn’t feel any heat! Hungry and frustrated, he admitted defeat at the hands of the German kitchen. He emailed the landlord to complain about the broken stove, but only after he went downstairs to his favorite Döner restaurant. 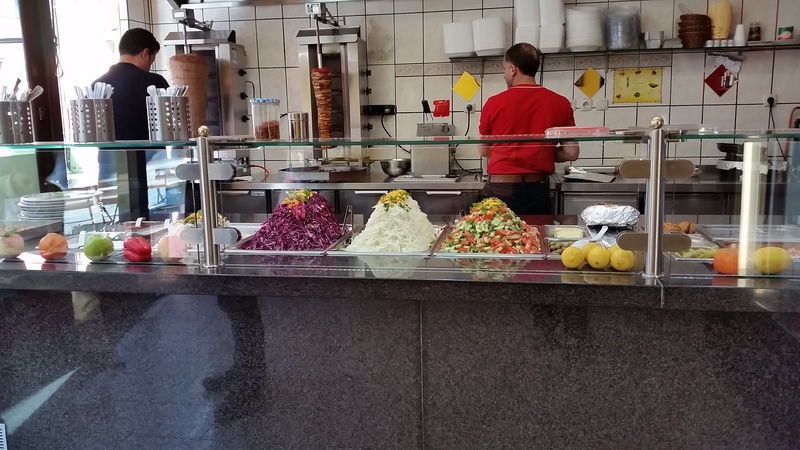 Döner Kebab: The Turkish response to the gyro. 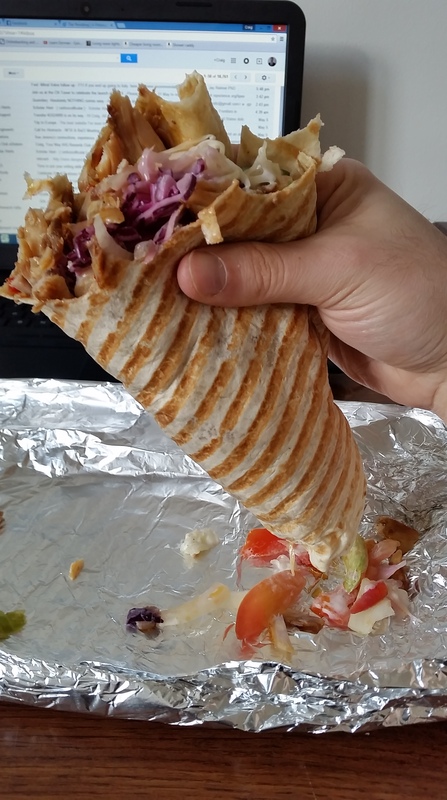 Shaved meats in a wrap stuffed with lettuce, tomato, onions, and red cabbage. AKA delicious! A couple days later, Craig got a response from the landlord about the stove. It’s not broken; it works by induction! Now, I freely admit I had no idea this was a thing, but the physics of it is actually kind of cool. Instead of using heat directly, it uses magnetism to generate heat. The alternating current of the “heating” element generates a rapidly alternating magnetic field above the cooktop. The magnetic field generates current in the ferromagnetic (read: iron) pan, which heats the pan, and heats up your food! P.S. I totally stole all that information from here. The point is, all of those fancy new non-stick pans we got for our wedding and then shipped across the Atlantic aren’t induction compatible, so they are utterly useless to us for the next 3 years. Wah-wah. Maybe we can make some abstract wall art in the time being? So, after a fire, burnt toast, the dissatisfying realization that he should listen to his wife more, a cold oily pan, an embarrassing email, a science lesson, and a trip to the store to purchase a new toaster and stainless steel pans, Craig can finally eat.